LAST NIGHT GOGGLEBOX returned to our tellys, just in time for the autumn weather to sink its claws in. It was welcomed back to Channel 4 with open arms, but there was one thing missing. Well, two things really: Dom and Steph, aka The Posh Pair. They didn’t appear at all on the season premiere, but fret not, Channel 4 has confirmed that they will return next week. Good! Because they’re the heroes of the show (along with Scarlett of course). Email “9 reasons why Dom and Steph are the heroes of Gogglebox ”. 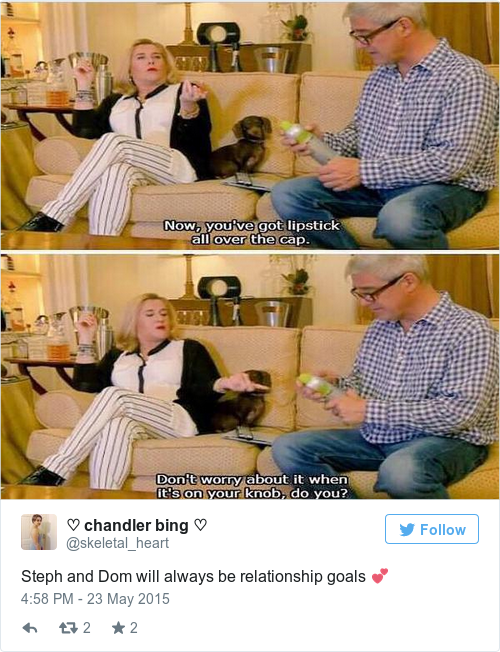 Feedback on “9 reasons why Dom and Steph are the heroes of Gogglebox ”.